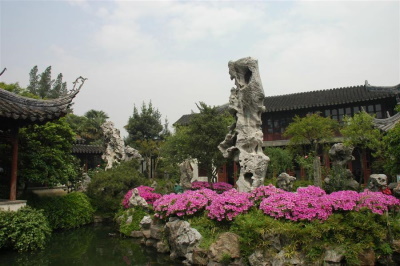 The Classical Gardens of Suzhou are the most refined representations of the art of classical Chinese garden design. They are complex landscapes imitating natural scenery with pavilions, rocks, hills and rivers. The designs were especially adapted to the small space available in private gardens. These five gardens date from different periods than the original ones (from the 11th - 19th centuries), but have been well-preserved too and show Chinese landscape gardening in their own right. Out of the nine designated gardens, I visited four on a daytrip from Shanghai. I choose the ones that are located near the city center of Suzhou: the Humble Administrator's Garden, the Lion Forest Garden, the Garden of the Master of Nets and finally the Canglang Pavillion. They are within reasonable walking distance from each other, about half an hour between each. The Humble Administrator's Garden is more what I'd like to call a park rather than a garden. Although space here is delusive: when I looked at the map of the garden at the entrance, I thought I would have to walk quite some distances. But all the scenery is linked and no space is left without any form of human design. Nearby is the Lion Forest Garden. This is for sure the weirdest of the four. A whole mountain landscape is rebuilt here with lots of Taihu rockery. A contemporary (14th century) poem reads: "People say I am in a city, but I suspect I am among thousands of mountains". Visitors nowadays can climb up, under and through these rocks, something even the Chinese grannies did with ease and pleasure. I found it quite difficult to find a way out of the 'mountains', I suppose I'm too big or too tall to fit through all the openings. To reach the Garden of the Master of Nets, you first have to brave an alley full of souvenir stalls and some beggars. The rooms in this house attract more attention than its tiny garden. The Canglang Pavillion is one of the oldest in this WHS. It now looks somewhat desolate and is partly overgrown. Highlight here is the Bamboo House with its play of bamboo and sun. To my own surprise, I rather liked my day at these gardens. The ones I visited are clearly different from each other and pleasing to the eye. And I also enjoyed myself by continuing to look out for "Things Chinese" - something I have started in Qufu inspired by the book of the same name. Besides the abundant Taihu rockery I ticked off a marble boat at the Lion Forest Garden, plenty of scenic openings in various shapes at the Canglang Pavillion and wonderful covered corridors in all gardens. During the very short business trip to Suzhou, I had only three hours in the morning for free time to explore the city, and after learned that my hotel was just 15 minutes to the old town by taxi, I did my best to visit one of the World Heritage Site listed gardens of Suzhou, the famed Zhouzheng Yuan or in English, the Humble Administrator’s Garden. At 7.00 AM my taxi dropped me at the garden entrance, the ticket office was still closed but some tourists were already waiting! After got ticket at 7.30 I entered the gardens. The garden’s entrance was quite simple and uninspired similar to usual side or back gates of many Chinese government buildings in many cities. However, behind the gate was totally a different world, the garden was very beautiful with hundreds of trees and plants. After walked through many pools, pavilions, zigzag bridges, stone gardens, artificial mountains, bamboo groves, I started to wonder the size of the garden. The garden was quite large together with the very genius landscape design made strolling in the garden similar to walking in the large botany. The man-made landscape in the garden was unbelievable; there were many Borrowed Scenery to create garden’s many centerpieces. Every turns provided new dimensions of surroundings, a very strict concept of Stroll Garden, but with numerous playful techniques by using gates and corridors, making the views from one gate to other gate to be more in-depth by dictating eyesight with new angles of views, a very sophisticating way that cannot be seen usually in other gardens. I spent a happy 2.30 hours in this garden, and I still saw only 60% of the whole area! I had to say that this garden was one of the most sophisticating gardens in Asia. It’s really show the complexity of Chinese landscape design, its long history of development, and hard work of many generations of gardeners. Sometime in my opinion, the garden was quite overwhelmed by too many details with no blank for simple breaking, but that really show me the outstanding of this garden that made this place to be deserved to be on the list of UNESCO World Heritage Site and one of the must see place in China. I managed to visit only 3 of the gardens. It was an ultimate aesthetic experience- the pools and pavilions, lotus and lilies, koi and cicadas, bamboo and pine, Taihu rocks and paved tiles......I could only imagine how pleasant it might have been minus the milling crowds! I wish I knew Chinese to fully appreciate the poetry. During my trip to Shanghai I stayed deux days and a half in Suzhou.the city itself is very charming, with its numerous canals and pagodas and museums (especially the new Suzhou museum). however its fabulous gardens are what made the city famous and I managed to visit six of them : the humble administrator's garden, the lion forest garden, the lovers' retreat garden, the master of the nets garden, the canglang pavillion and the lingering garden. the Humble Administrator's Garden is certainly the most impressive of the lot (and the largest). 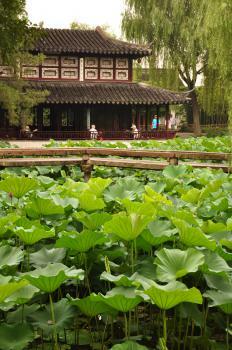 the sight of the lotus ponds surrounded by traditionnal buildings is very attractive. however the garden was quite crowded (with lots of tourists groups and megaphones) and that kinda ruined the experience for me. in the garden there's also a garden museum which is very informative and links the different gardens together. A little further is the lovers' retreat garden. you can easily reach it by foot from the lion forest garden (the walk through the old lanes and canals while watching the inhabitants in their everyday life - i noticed two or three ancient wells i passed by- is a pleasure). now there were very few tourists in this one! while it may not be as impressive as the others, this small garden felt very peaceful and had wonderful windows. i began the next day by visiting the master-of-the-nets garden. this is said to be the smallest of the lot, but i didn't feel so. it had marvelous buildings and courtyards. most importantly, it wasn't heavily visited (it was a monday morning, so that may not always be true). not far from it is the canglang pavillion (again, barely visited). it was the wildest looking of the lot. from time to time you could feel as though you were really in a natural forest on a hill. the sound and sight of the wind shaking the ancient trees and the green leaves falling gently to the ground will always be an unforgettable experience for me. the garden's windows are also worthy of attention, while its location , overlooking a canal and old houses, is pretty romantic. the last garden i visited was the Lingering garden on the next day. at first when i entered the garden, i feared it would be as overcrowded as the lion forest garden. however despite the eventual crowds the garden was large enough to allow me some moments of serenity and contemplation. this one was almost as impressive as the humble administrator's garden, and i especially enjoyed its plants and its rockeries. a beautiful end to my stay in Suzhou. All in all, i found all the gardens i visited to be great and they compliment each other well. each garden has its own particular features and its own personality. the many details (windows, painting-like views, piece of architecture...) are wonderful. The classical gardens of Suzhou are, in my opinion, the most sophisticated, developed, atriculated, and complex, uses of privet urban space in the world. beautiful and fascinating. Ditto the comment by the previous reviewer. Unless you are really into the culture and history of the scholar class in Suzhou, you are not going to appreciate it from other more robust sites in China. The pagoda, which was not part of the garden, was integrated into the design to give the lake a nice vanishing point. A nice touch, but again, it was just a private garden. To include the Canglang Pavilion, the Lion Forest Garden, the Garden of Cultivation, the Couple's Garden Retreat, and the Retreat and Reflection Garden. Botanical Gardens: Wangshi Garden (The Master-of-the-Nets) - It is one of the rare and unique botanical gardens of its type that remains. 232 Community Members have visited.